Ceiling fans have always been some of the most straightforward electronics at home. However, they can be pretty inconvenient if you want to adjust their setting without moving from your position. As they’re often regulated by a wall switch, you’ll often have to go to the switch to up its setting or turn it down. Those were the old days, though. Today with everything starting to become “smart”, ceiling fans are certainly not about to be left behind. For example, you can now bring home the Haiku L Series Smart Ceiling Fan. 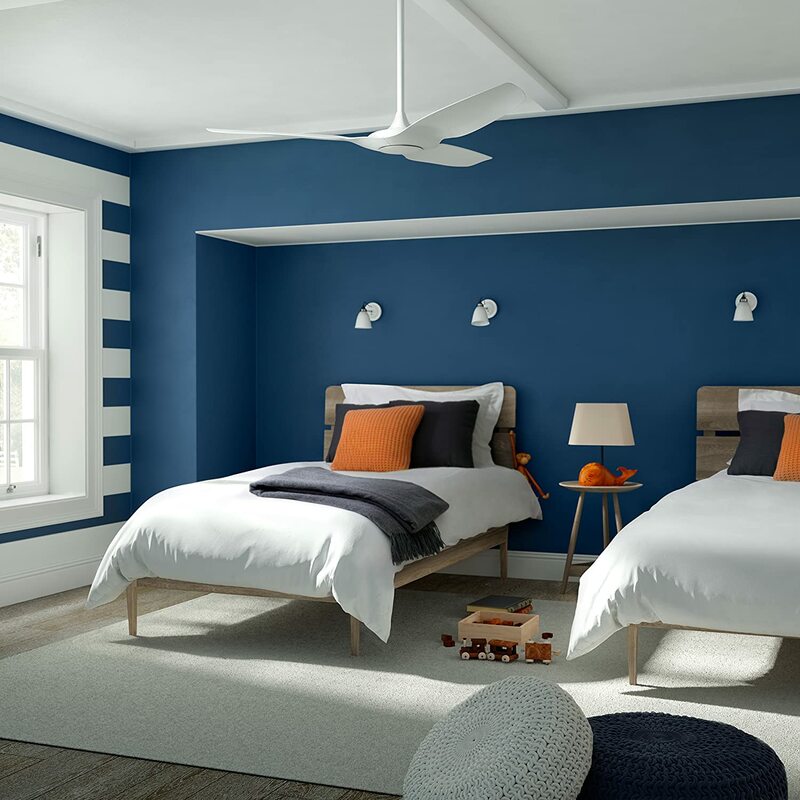 Touted as the world’s first smart fan, the Haiku Home L Series is a luxurious ceiling fan that will not only make your home more comfortable, but a lot smarter as well. It’s certainly one of the first smart ceiling fans available in the market today, making it a novel concept and product that you might want to try if you’re interested in creating an ultra-modern home. Haiku’s patent-pending technology is the very reason why the L Series Smart Ceiling fan is so smart. This technology is basically designed to make the brand’s products more comfortable by adding components that will make operation a breeze for you. It’s equipped with motion and climate sensors so you don’t have to bother about turning the unit on or even adjusting it manually. These sensors will automate the fan’s operation, making your home more efficient. The system also includes the wi-fi radio. This allows you to control the fan right through the app. With this, you can easily program the fan’s functions. While tons of ceiling fans already have light integrated to make them more efficient, the Haiku Home L Series Smart Ceiling Fan takes the concept to a new level. By using LED bulbs, this ceiling fan will not only cool your room but light it effectively as well for a lower cost. LED lights are the next big thing in power saving lighting, so it shouldn’t come as a surprise that a smart ceiling fan has one. To make the operation of your smart ceiling fan even easier, you can download the Haiku Home App. An essential part of the app is its ability to let you customize and control the fan’s performance. You can choose its fan speed and light’s brightness level easily at its landing screen right after you select the ceiling fan you want to work within the app. Below the landing screen, you’ll find five icons that represent different features of the fan. The first one is a book icon that will let you control the temperature. You can opt to turn on its climate sensor through this screen as well. Since the unit can sense when you enter and leave the room, you can also opt to turn the feature on and off through the app. You can create a setting for your smart fan and have it run at selected times of the days through this feature. No more tweaking every time you get home as you can also schedule a select setting for different days. To help you save some energy, you can also use this unit’s sleep mode to automatically turn off the unit when it’s not needed. The Whoosh mode is another unique feature of the Haiku L Series Smart Ceiling Fan. This will imitate a cool breeze running through your room, letting you enjoy a fresh environment. The unit comes with a remote control as well. It will let you do most of what the app can do, except for setting temperatures and tweaking the motion sensor. It’s a nice addition to the unit as it can be a handy tool for the other members of the household who don’t want to download the app on their phones. You can also opt to get a wall control unit that does all the things that the app can do. This requires an additional purchase, though. This Haiku Home product is compatible with the Nest Learning Thermostat and Amazon’s Alexa so you can easily use voice control to manage it. The unit looks great. Haiku Home is known to create gorgeous products so this shouldn’t come as a surprise. However, this is still a very great plus since you’re already paying a lot for the unit. It’s whisper-quiet while in operation. Whirring noises tend to bother a lot of people so they skip owning fans altogether if they can find other ways to cool their homes. This shouldn’t be a problem with the Haiku Home L Series, though, as it operates in silence. It’s lightweight. Weighing just 11 lbs, it’s definitely a lot lighter than other ceiling fans. It’s definitely well made. You can count on this unit to last for a long time. It’s pricey. Like most “smart” items, the Haiku L Series do not come cheap. Only the units bought through Amazon come with the wi-fi module. You’ll need to get the app to get the most out of the unit. If you’re wondering whether this product is worth your money, the answer here would totally depend on you and your needs. Ceiling fans hardly changed in over a century because its purpose is very basic. Adding these automatons are part and parcel of modernization and certainly, make things more convenient. The Haiku L Series Smart Ceiling Fan is your best option when it comes to smart ceiling fans. This product is very well-thought out and planned to help make its operation a lot simpler. It will surely add value to any smart home.